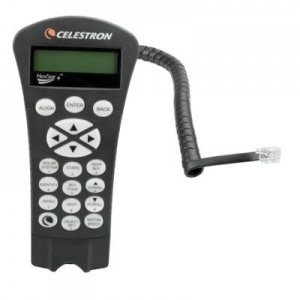 The Celestron NexStar+ EQ Hand Control is the standard computer accessory on all current equatorially mounted Celestron go-to telescopes: Advanced VX, CGEM, CGEM II, CGEM DX, CGX, & CGE Pro computerized telescopes. With the push of a button, you can access NexStar+"_s huge database of over 40,000 celestial objects. Automatically slew to objects in a variety of catalogs, including the Messier, NGC, Caldwell, and SAO brightest stars. The planets as well as a list of the most popular objects are also included. Not sure what to look at? Use the Tour Mode, and you"_ll be shown a selection of the most popular objects for the time and date you are observing! NexStar Plus includes many setup conveniences like customizable max slew speed, All-Star Polar Alignment, programmable slew limits, and more. This hand control includes USB Flash Upgradeable Technology, allowing users to upgrade its software with Celestron Firmware Manager.